Of all the questions we get from our readers, one frequently asked is: “Where do I find the money to start (or grow) my practice”? The question of where to find the money to start a business is not unique to clinicians. It’s a hurdle to be climbed by most new and established entrepreneurs alike… across all industries. Even though it may not take a large amount of money to get started, it usually does take some money to get going…aka ”It Takes Money to Make Money”. There are three things I’d like to discuss. These are considerations and questions that need be addressed before starting your search for financing. Because the decisions you’ll make will guide your search for the best (and most appropriate) financing available. Do I have absolute clarity? Could I bootstrap or should I take on debt? I know this one is just too simple! But before you can look for financing, you need to be clear about what it is you’re trying to do. You won’t believe how often someone wants to start a practice (or business) without having a real clear idea of what they’re trying to build. All too often we get trapped into thinking we know what we want, when in fact, all we have is a vague idea of what we think we want. Ask yourself: “What exactly is it I want to create? What is it I want to build”? Will I start a small practice or will it be a bigger, multi- provider clinic? Will it be a primary care or a specialty clinic? Will it be a cash practice or will it be insurance based? Will there be enough demand for the services I want to provide? Do I need staff? How many staff will I need? How you answer these questions determines how much money you need to get started (or expand). If you don’t have the answers, all you’re doing is wandering in the dark, hoping to find a light. The greater clarity you bring to the table, the easier it will be to make the right financing decisions. Ideally, you’ve done your business plan before looking for financing; once you’ve finished your plan you’ll definitely have clarity! Another question to ask is: “Should I start my own practice/business or should I buy an established practice”? This is a pivotal decision. Because… buying a practice will take some serious money! But then again, you may find a situation where the seller is willing to finance the purchase for you. Sellers often are willing to work out favorable financing for a buyer. This might include accepting monthly payments with a lump sum payment due in the future, or any number of terms. Sellers may also agree to stay in the practice to help transition the office to the new owner, you. When you buy an existing practice, the value is in the patient base; by staying through a transition period patient “flight” will be minimized as patients have an opportunity to meet and get comfortable with you and your team. Regardless the agreement buyer and seller come to, buying an existing practice or business may take longer than starting your practice from scratch and it could also take more money. But if you really want to buy a business rather than build it, you probably can find one that is just right for you, including the terms. Again, having clarity about what’s important to you will help you find what you want. If you determine that you’d much rather build your business from the ground up, you may find this route to be faster and potentially less cash-intense. In addition, starting your own business gives you the opportunity to design it exactly how you want it. You can start the business as small or big as you like and you can move forward as slow or as fast you like. The way to start your business simply depends on what you want to do and how you want to do it! This is another question you want to look at. Should you bootstrap your business or should you take on debt to get started? Of course, the answer to this question is closely tied to how much money you need to get started and if you want to buy an established practice or build the business yourself. Bootstrapping is often utilized by small startup businesses. It simply means you finance your business using your existing resources while limiting your expenses to the absolutely necessary. Existing resources might include personal credit cards or dipping into savings. Like anything, bootstrapping has its advantages and disadvantages. While it’s great not to take on a mountain of debt, it probably also means that the rate at which your business can grow is limited. The business building process is typically slower when you bootstrap. Purchasing equipment (new or used) that actually could help you generate revenue. Starting your office in a space large enough to accommodate reasonable growth. When you bootstrap your venture, you try to spend only what you absolutely have to. You also try to finance your business or keep your doors open with cash flow from the revenue you actively generate. One of the considerations for a medical practice is the insurance reimbursement cycle. While electronic billing has lead to significantly shorter reimbursement cycles, this still can cause a problem. If you are a new office and need to get credentialed with insurances, then reimbursement may be delayed until after you are credentialed (a process that could take from weeks to months). So be aware and plan accordingly. It may also take some time for a brand new practice (and provider) to have regular reimbursements from insurance companies come into the office. If possible, determine how fast you can generate consistent and reliable cash flow. Have a “plan B” for the time you’re expecting to wait for your reimbursement checks. Of course, if your practice is primarily cash based, this won’t be an issue for you. One more thing to remember when bootstrapping is the potential drain on your personal finances and the emotional stress it may create for you and/or your significant other. At times money might get tight and tough decisions may have to be made. Just make sure you’re willing to “pay the price” to get your new business off the ground by bootstrapping it. Taking on debt, on the other hand, comes with its own issues. For starters, not everyone is in a position to take on financing or qualify for favorable loan rates. Some people have high debt to income ratios that make it difficult to be considered for financing. Others have adequate income but have had problems with their credit in the past and hence run into obstacles when applying for financing. And others yet have a great debt to income ratio, a perfect credit history and still might get turned down for a loan…. just because. So in reality, most small business startups use a combination approach. They get started in business by primarily bootstrapping the venture, using credit cards, savings, or income from a job. At the same time or at some time later, they move toward taking on small, limited amounts of debt to finance their business. They may shop for a line of credit, establish trade credits, get a business loan, or use a business credit card. All in all not a bad approach! Important to remember is that you need some source of cash to start your business. You also need hard cash to keep the business going until you can generate consistent and reliable cash flow from revenues. When looking for funding for your startup or to expand your existing business, you’ll find that there are many options available (some better than others). I’ll be discussing various financing options in another article. While getting money for your business may seem like an insurmountable challenge at first glance, you’ll see there are actually many choices and options you can tap into. Keep in mind that every situation is unique. 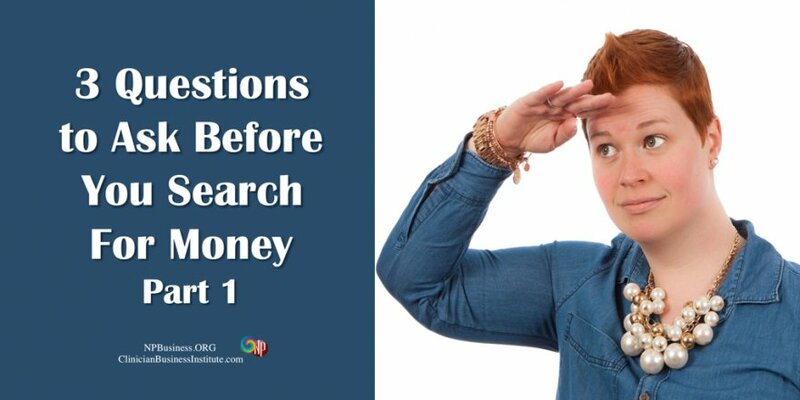 The amount of money you need to get started or to grow largely depends on how you answered the three questions discussed in this article. What your financial needs are and what will work for you may not work for another NP. So make sure that you choose the options that make the most sense for you. Finding financing may well be an ongoing challenge not just as you start, but also as you want to grow and expand your business. Do you have absolute clarity on what business you want to start or grow? Have you considered buying vs. building; bootstrapping vs. financing? Let us know what you think and leave a comment below. By Johanna Hofmann, MBA, author of “Smart Business Planning for Clinicians” and regular contributor to the NPBusiness blog. In found that boot strapping worked well for me. I was not in a position to borrow a lot of money. You can grow your business services and equipment as your business grows. If there had been the letters MD behind my name, I am sure that borrowing a lot of money would not have been a problem. I had to work a lot of hard, long hours but was able to pay back my small loan the first year. I was blessed but also found a niche that needed to be filled in my community. I have now grown to four provider office and purchased my own building after five years. Congrats on your success Theresa!